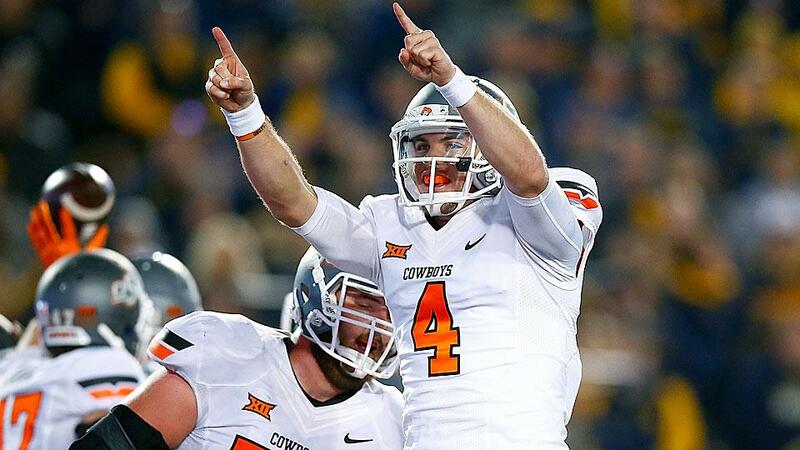 Week after week the analysts project big things for the Big-12. And week after week it seems the Selection Committee disagrees. First, the AP-poll’s second ranked Baylor Bears had high aspirations, but despite its prolific offense, the Bears debuted in the Playoff Rankings at #6, behind two one-loss teams, despite Heisman candidate Corey Coleman and the top-rated quarterback play of Seth Russell. In Week 11, after a dominant win against top-10 TCU, many analysts had the Oklahoma State Cowboys in their personal top-four. But the committee wasn’t so easily swayed and they saw their stock rise slowly to #8. Baylor, without losing, was jumped by Iowa to remain at #6. The Sooner state continued to roll last weekend when Bob Stoops and co. traveled to Waco and left with a victory, shutting down the unstoppable Bears and limiting the unstoppable Coleman to just 51 yards on 3 catches. Again, the analysts projected major movement from the Big-12 schools, especially after an unimpressive performance from Notre Dame, but again, the Selection Committee had different ideas. It was expected that the top-3 would remain the same. There were no surprises there as Clemson, Alabama, and Ohio State continued to win and win well. But there was plenty of discussion as to who would take the fourth spot, whether or not an undefeated Iowa or Oklahoma State could take it away from one loss Notre Dame. The Sooners, who are playing as well as anyone in the country, was regularly thrown into the mix as well. Despite the conversations and speculations leading up to Tuesday night’s reveal, it seems the Committee was just as steadfast on Notre Dame at #4 as everyone was on the top 3. Committee Chair Jeff Long commented that the Irish are, in fact, solidly in at the last playoff spot, adding that they look consistent and talented on both sides of the ball. Long has mentioned multiple times that the top four teams were pretty solid and that the Committee was in agreement that they remain the same. There was, however, plenty of debate between 5, 6, and 7, and we are led to believe that these three teams (Iowa, Oklahoma State, and Oklahoma) are very close to each other. With three weeks left in the season, or two if you’re the Cowboys and the Sooners, there is plenty of football to be played, and Long has gone on record of saying that teams do not control their own destiny. Too much happens week to week and college football games don’t take place in a vacuum. The committee tries to avoid speculation in all things, so the opportunity for a top four shake-up remains. The Big-12 is inching closer. Three teams are in the top 10 this week, though at least one of them will lose (Oklahoma State plays Baylor at home) and likely drop out. And without a team in the top four for the third week in a row, does getting closer make much of a difference? Long’s comments on the solid standing for the top four teams is concerning for those looking in, as it seems something major would need to happen in order to see any change take place. Ohio State is the only one of the four with a challenging week 12 matchup (home against #9 Michigan State), so a shake up is unlikely this week. After the Big-12 was left out of the playoffs last year, and with no conference title game to give the winner a boost in the eyes of the Selection Committee, what are the likes of Baylor, Oklahoma, and Oklahoma State to do to push into that final four? The message seems pretty clear. Pray. Pray for a loss from one or two of the current top four. For if each of those four teams wins out and adds a conference title to their resume, it seems the Big-12 will be on the outside looking in yet again in 2015.